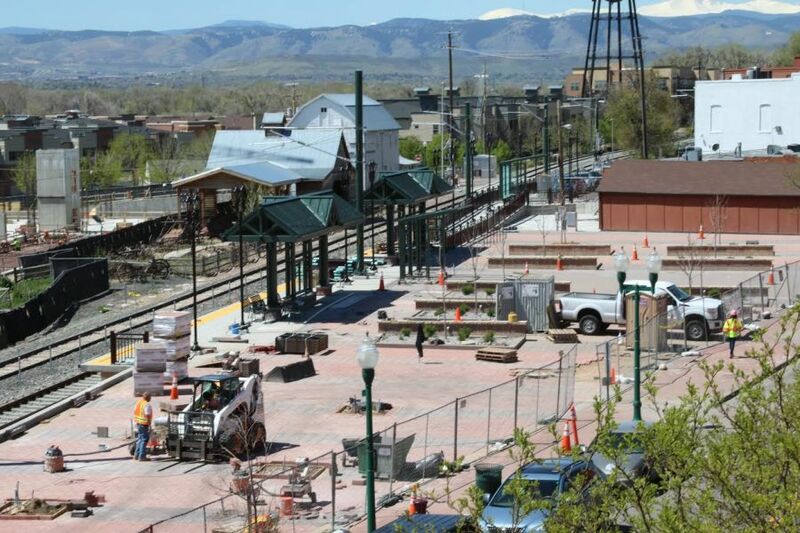 On April 1, 2019 the Regional Transportation District (RTD) announced that the grand opening for the G Line will be on Friday, April 26. The commuter rail will open with quiet zones in place along the entirety of the line, although horns will continue to be used in emergency situations; if maintenance workers, pedestrians or vehicles are on or near the tracks; if there are issues with gate timing at any of the G Line’s 16 crossings; or if a train must use automatic train control. Located in Arvada’s historic downtown, the Olde Town Hub is the most prominent of Arvada’s three G Line stations and an important retail, mixed-use, and cultural destination for visitors from throughout the Denver region. The art selected for the Olde Town Hub is titled “Track Bone.” It is a sculpture that reflects the fact that the railroad was in many ways the backbone of Arvada when it was founded in 1870. The sculpture is made of Red Colorado Granite cut into sections of railroad track. At completion it will be 28’ long, 4’ 6” high, and 7’ wide. If you have trouble viewing the video below, please watch it on YouTube. The artist behind “Track Bone” is Frank Swanson. To find out more about the artist, please visit his profile on RTD-FasTracks.com.